BABA’s IPO really was a bell at the short-term top, not the long-term. I strongly feel this move is simply a correction allowing for further upside for the equity markets, as I laid out with my “chop & drop” charts. The real question is whether we get a V-shaped correction into a breakout of new highs as the bull trend resumes or is there further downside action. It’s hard for speculators to let go of 2013. You can see that despite all the fuss being made over the 200-day MA being passed on a daily chart, there’s virtually no chance of that happening on a weekly chart(which has more meaning). Additionally, one can see that the 50-day on a weekly presented a natural support area. Subsequent price action proves that out. The sell-off reached extremes in so many names during the course of last week, that by Friday, we were due for an immediate bounce. This is perfectly normal behavior in a correction of over 10%. Yes, I say 10% because this one probably hasn’t reached its nadir yet. 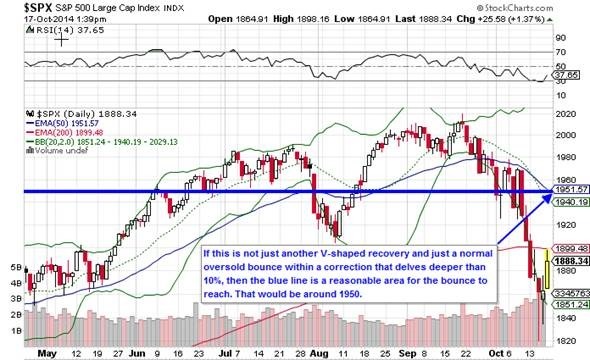 Using my drug-store technical analysis, the blue-line above represents a fairly basic resistance point for the S&P 500 to obtain in the bounce. 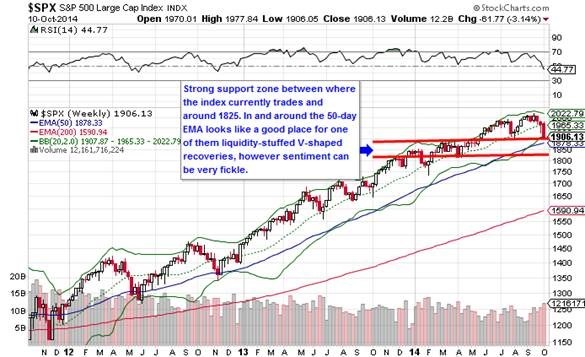 Six months ago I shared my thoughts that in order for the S&P 500 to finally take a break, the market would need to see what I deemed to be all 3 legs of the “risk stool” to be kicked out. It started with biotech. Then moved on to small caps. Finally, high-yield fixed income sold off. Combine that with the liquidity vacuum of Alibaba in combination with some Ebola fears for the airlines, the darlings of hedge funds, and WHAMMY! The sell-off has greeted us in fine fashion to start the fall season. The deflationary action in commodity prices, specifically oil, has compounded the speed of the move downward in equity markets. I think that will help to compound the fear a little longer, which is why I suspect we’ll see a bounce and resumption versus a V-shape move off the low. Fear has a predictive way of making people wait for a bounce and then selling off again at whatever profit can be garnered, further exacerbating the corrective action. 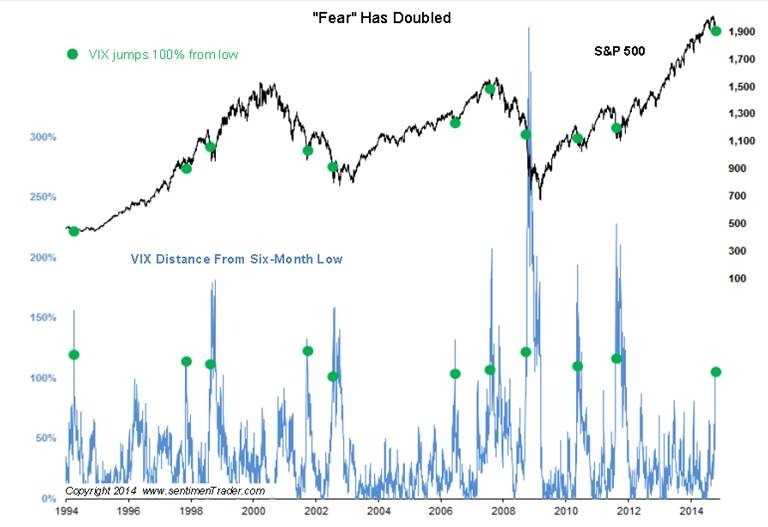 About a week ago, SentimenTrader shared a chart displaying typical action in the VIX, “the fear gauge.” It showed price action over the last 20 years, anytime the VIX jumped 100% off its six-month low. The chart may be instructive because you can see that except for 1997 and 2006, there was always further to go before a bottom. 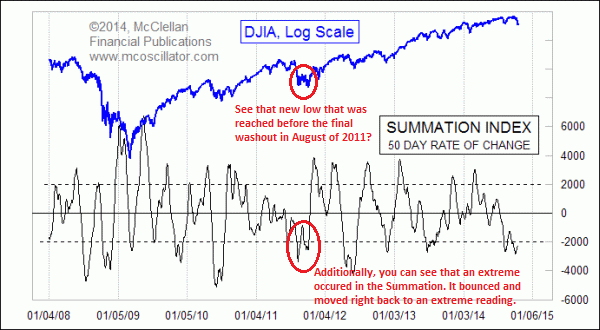 McClellan offered his opinion of the level of extremes based on his Summation Index. The oversold levels of the stock markets have already led to the beginning of a bounce, however it doesn’t mean we’re out of the woods yet. The same thing occurred back in 2011. Let’s come back to JJG, the ETF holding corn, wheat, and soybeans. In an earlier post, I’d stated I would tell readers when I thought it was go-time on this commodity trade. Well that time is now. My go-to indicators are giving a buy signal. Yes, bumper crops are expected but as we know, supply and demand are not always the ultimate arbiters of value in futures pricing. Sentiment reached extremes and speculators are positioning accordingly. The price action may bounce around at bottom here for a bit, but the downside risk has been significantly reduced. Additionally, you’d hate yourself if you missed out on a coffee-style trade. I also want to revisit my Delta Airlines short. That was liquidated for a profit, but it was a difficult one for me to stomach, as I irresponsibly held the position. It was a simple trade. I played some Calls on the Transports, and some Puts on Delta. You can debate the finer points of whether I was hedged or simply neutral. I didn’t run the trade through a monte carlo simulator while statistically evaluating the correlations, so forgive my lack of sophistication on this one. I made a move. It paid off, fortunately. The problem was that I profited much faster on the Transports and then closed the position leaving me unhedged in Delta. The unrealized loss in the position was quite extreme, but my analysis felt sound and the duration of the option gave my thesis plenty of time. That was very undisciplined and a trader should always mind their stops. Sometimes though, a human’s hunches get the best of them. I’m not different. This situation worked out. 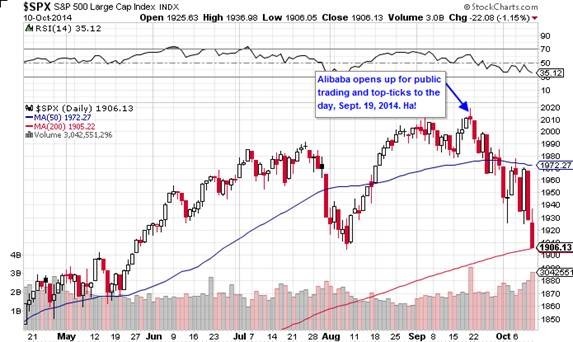 Because along came Alibaba and Ebola and away we went with the downside move. 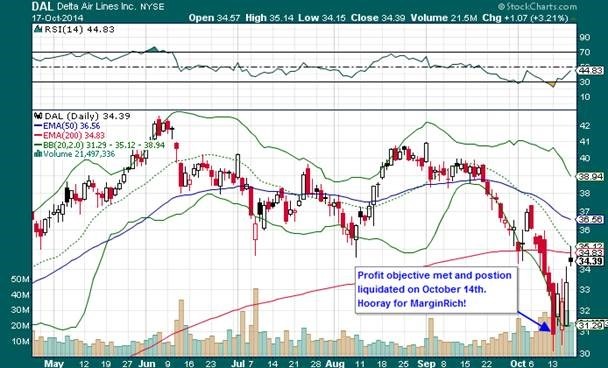 I had stated that I thought $30 would be the profit point, and fortunately I was able to liquidate the holding for a tidy 50%. My analysis was sound, but I got lucky despite my lack of discipline in this particular trade. The total market catalysts really assisted the drive to profit, but I’ll take’em as they come. Keep your eyes open and don’t get too jumpy on your shopping lists. If you have to buy, then ease into a position. That’s how the professionals allocate capital into holdings and you’d be wise to speculate in the same way when establishing a stake. Although I’ve called for a resumption of the downtrend to further lows, nobody should be surprised by a liquidity-backed V-shaped correction. Anything’s possible in today’s equity markets.